A guide on how to make the largest soul eater possible. Have the largest possible soul eater in your hand while your opponent can only take +1 faeria. You cannot use cards that add random cards to your hand or the board such as Magda, bloomsprite, Orosei, or spellwhirl. .The first step is to set up Ulani's Medallion to turn lots of creatures into carassiuses. Play four lakes and two mountains, then play Fugoro and all three copies of gemshell tortoise and rain of fish. All three tortoises should draw carassiuses and Fugoro should draw Ulani's medallion. Now play a forest and a desert, play one carassius, and use Ulani's medalliion on it. You should now have 23 swarming carassiuses on board. Now that we have our carassius swarm, we can set up spirits of rebirth to further power up our soul eater when we kill them over and over. Play your second forest and then play three spirits of rebirth. Play both shamanic dances on one of them. Let the sacrifices begin. First, make sure you have a soul eater in your hand. Then, play failed experiment into plague bearer and then play a carassius. 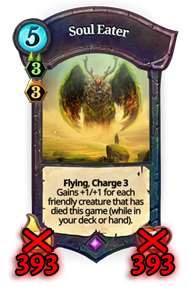 Play a desert, play another plague bearer, and use spirit theft on it. This time, you will have to kill a carassius with either soul drain or seifer's wrath to play a plague bearer, so do that and play plague bearer into spirit theft again, then repeat this step. Play carassius and use Aurora's creation on it, then play famine twice. Play carassius again, kill another carassius, play your last plague bearer, then kill it with your last soul drain or seifer's wrath. By this point, all of your spirits of rebirth will be dead and all 220 powerups should have landed on the soul eater. If this seems unlikely, don't worry; it should only take about 10^232 tries to get right. Play your last carassius and then play doomsday. Play your thrid desert. Play your third forest. Finally, play your soul eater. If all has gone well, it should have 393 attack and 393 life.